A recent garage sale find of a mega rare Cher outfit called “Radiant Ruffles” a Bob Mackie design made it’s way to eBay. This piece is loose with some imperfections. 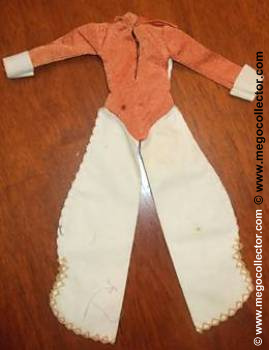 There isn’t much information about this outfit to be found on the internet; however, additional research outside the scope of this eBay auction has indicated that this outfit and a handful of others were featured as Cher’s Costume Assortment on page 6 of the 1977 Mego Toy Fair Catalog. There were 12 outfits in all in this ultra-rare assortment. It is generally believed that these outfits never made it to the market. These details are provided in the auction description. Produced only in 1977. 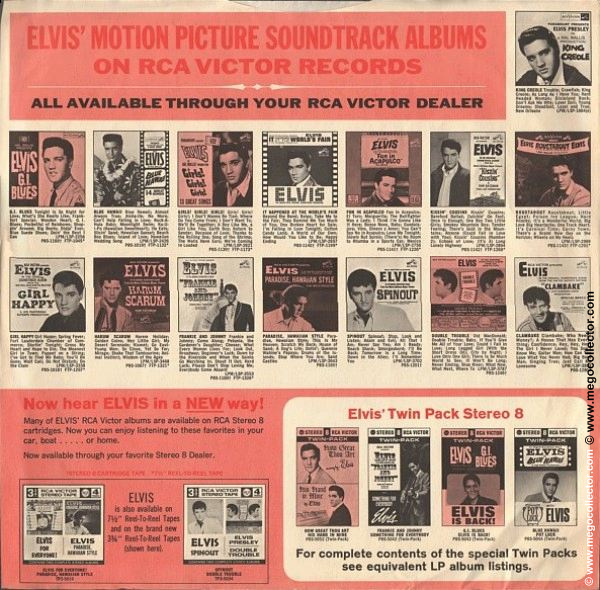 Shown only in the Mego 1977 dealer catalog. Design is a one piece gown with coordinating short jacket. 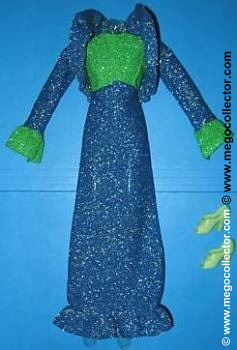 The gown is sleeveless, the bodice is made of green lurex, (the same fabric was used for Cher’s Grasshopper gown), a navy and silver lurex empire waist long skirt with ruffled hem complete the gown. The jacket is of the same navy and silver lurex, ruffles run all around jacket with coordinating cuffs. Mint-Green colored open toed heels complete the outfit. Cher is not an area in collecting I understand very well, but it is Mego and it is interesting to see for how much these outfits can sell.